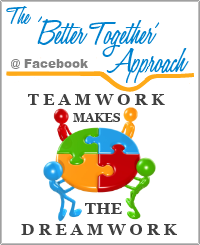 "The 'Better Together' Approach is an idea that is touted in a Linkedin Group that reinforces the value of collaborative efforts. It is the "givers gain" idea purposefully orchestrated to deliver success to all those who unselfishly participate. Indeed, it is The Golden Rule put in a business context. What goes around does indeed come around. Primarily this networking group is for small to medium businesses to meet and join together to form a group of motivated people who lift each other up with referrals and information. In this group we welcome everyone from just about anywhere. Having said that, many of the participants are local to Florida although we have many people from around the U.S. and the world. 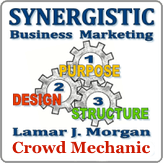 This group features the "Feature Friday" free consultation call where participants are welcome to introduce themselves and their business to Lamar Morgan. Ask Lamar about conducting business on the web or about social media interactions or management. There is no catch to this; it is what it says it is - your questions can remain private between yourself and Mr. Morgan OR they can be put into an article that would help you spread the word about your business and endeavors. Ask Lamar about getting a press release to publish at Biz News Buddy too. This group is new as of March 2014. It involves building "cluster" groups of 3-4 people each to band together to lift each other up at social media platforms and with referrals. A great testimonial from a client or third party is the best way to spread the word about any business. Once a group is formed those participants will have the advantage of having their group listed on the "Clusters" page of this website. Mentions will include a link to the website of each business. Guidance will be presented in the group on exactly how to go about proceeding with the cooperative effort for individual clusters. Visit the Clusters page for more information.